Collector Office Recruitment 2017: Collector Office Balod Has announced its recent recruitment in their offcial website. you can find the Application Form in offcial site For Assistant, Data Entry Operator posts. Refer the notification to find All Eligible details. If you are eligible Candidates then you can apply this job. 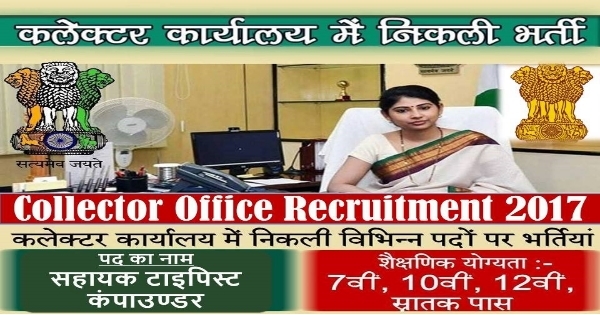 All details have mentioned in Collector Office Official Notification and Apply Offline Before Or On 10-05-2017.More details of Collector Office Jobs 2017 like Qualification & Eligibility conditions or how to apply are given below. Age Limit range : - age limit range is 18 years and maximum 35 Years as on 01-01-2017.
salary :- Candidates can get salary INR Rs. 16820/- Rs. 18900/- Per month. Apply procedure: - All Eligible job seekers Can Download application Form through official website http://www.zpbastar.cgpanchayat.gov.in . After Filling The application form, candidate must send hard copy of application along with relevant documents to the following Address before or last date.